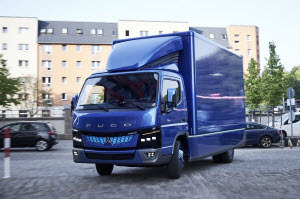 Mitsubishi Fuso Truck of America Inc. (FUSO) announced it will bring limited-production line fully electric trucks to market before the end of 2017. The company also announced development of a new gasoline powertrain for its FE Series medium-duty cabover trucks. The company will bring limited-production line fully electric trucks to market in the U.S., Japan and Europe before the end of 2017. FUSO has dubbed this new, all-electric, battery-powered medium-duty work truck the eCanter. It will be the first 100% plug-in electric work truck designed and produced by a major truck manufacturer, and the first production models are scheduled to arrive in the U.S. later this year. The eCanter is a Class 4 truck with a 15,995 lb. GVWR and a payload capacity of roughly 9,380 lb. It has a practical range up to 100 miles, 1- hour quick charge capability, and standard 8-hour overnight charge. The eCanter also offers flexible battery configurations, so end users can choose between maximizing the eCanter’s range to its full capacity of 100 miles, or working with a somewhat smaller range in order to maximize its payload. The new gasoline powertrain for the FE Series medium-duty cabover trucks was premiered. The company showed a prototype of the new truck during a press conference at WTS17. This addition to the FUSO line reflects a significant expansion of the firm’s commercial truck product line. The new V8 gas engine models will also be the first FUSO vehicles to be assembled in the United States. Daimler’s Freightliner Custom Chassis Corporation will perform the work at its Gaffney, SC, plant, using engines and transmissions built in the U.S., and chassis, cabs and axles sourced from FUSO in Europe and Japan. As mentioned, FUSO is offering this powerful gas truck not only in Class 3 and 4, but also as the industry’s only Class 5 gas-powered model. Operators can take advantage of its best-in-class payload capacity when operating this larger truck. Customer trials for the new FE Series gas trucks are scheduled to start in 4Q2017, with full market launch to follow in 1Q2018, as 2019 model year. For more information, visit mitfuso.com.